Suburban Long Island, where I grew up as a kid, was an extremely whitebread area. There was only one African-American kid in my class during my grade-school years–his name was Alonzo Cook, which I remember solely because of his uniqueness. Consequently, I had (and perhaps still have) a cartoonish understanding of Black culture, formed primarily by television and films. Link Hayes from the Mod Squad would have been my barometer, I’d imagine. All of which is preamble to explain why it was that I liked Tyroc. 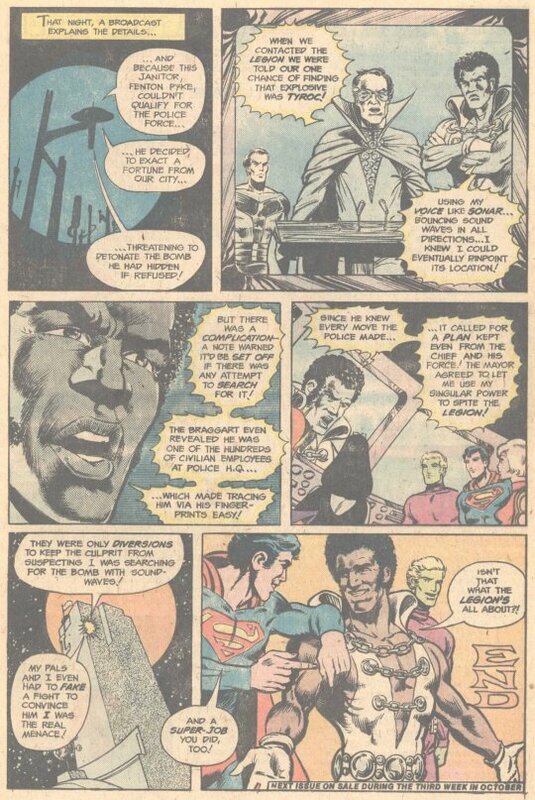 I had missed Tyroc’s previous appearance in SUPERBOY AND THE LEGION OF SUPER-HEROES, but even if I had read it, I’m not convinced that the problem with its premise–that all of the Black people in the 30th Century lived on a brigadoon-style island that appeared infrequently–would have been apparent to me. 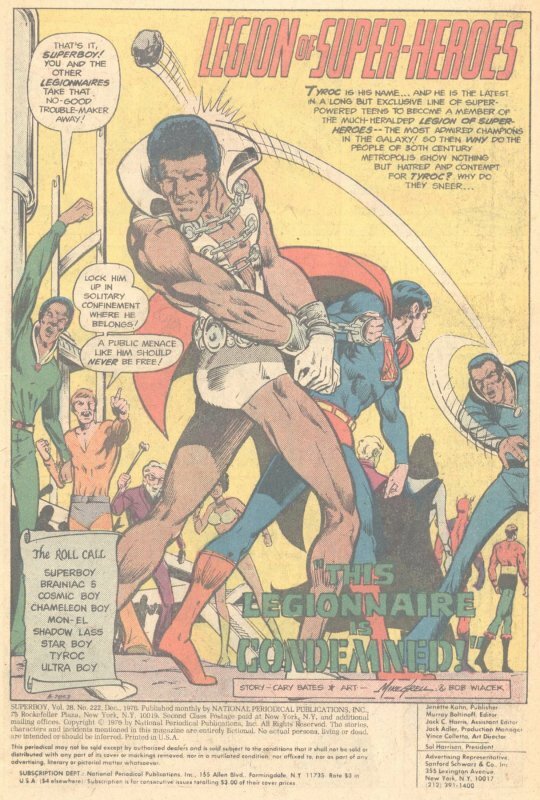 Artist Mike Grell has said that he hated Tyroc as a concept so much that he deliberately gave him a ridiculous costume–but I kind of liked it. The bare legs were a mistake (as they almost always are in super hero attire) but apart from that, I liked the look. I also didn’t have enough life-experience to see how images such as this splash page were rife with subtextual context. But hey, I was nine years old at this point, cut me a little slack. 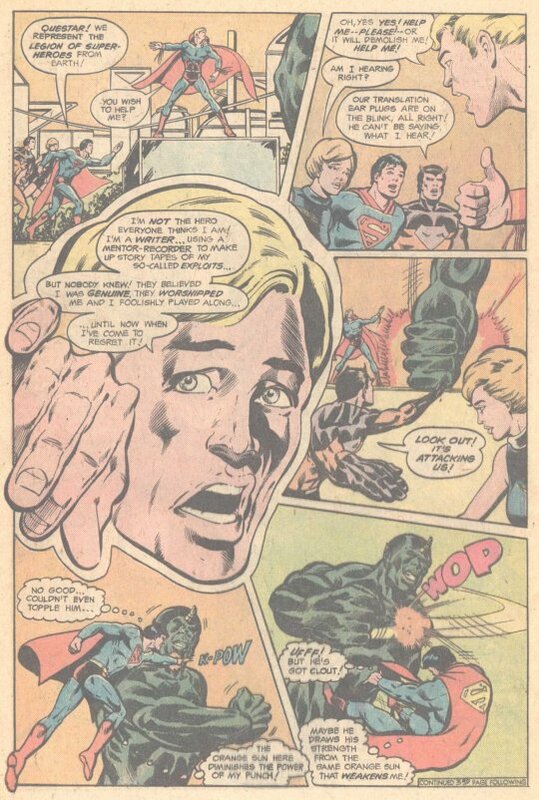 In any case, this issue of SUPERBOY was the next comic book that I picked up at my local 7-11. 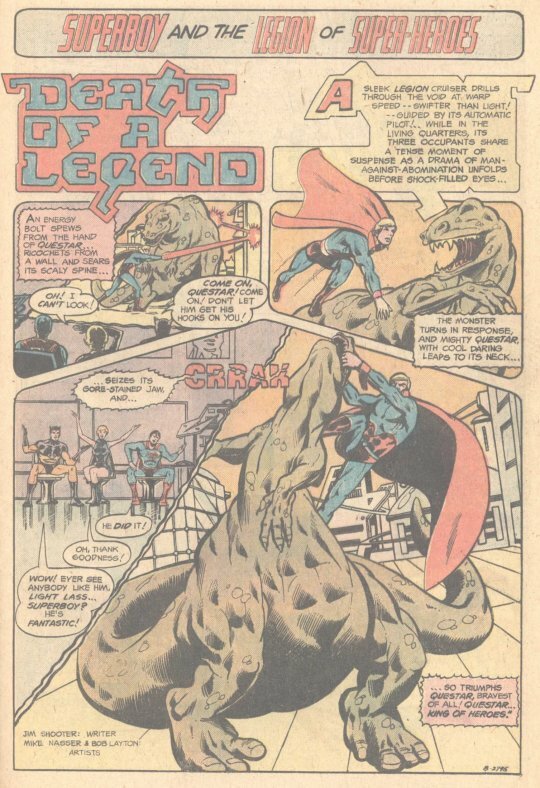 As usual, it contained two stories, the opener written by Cary Bates and the back-up handled by Jim Shooter. 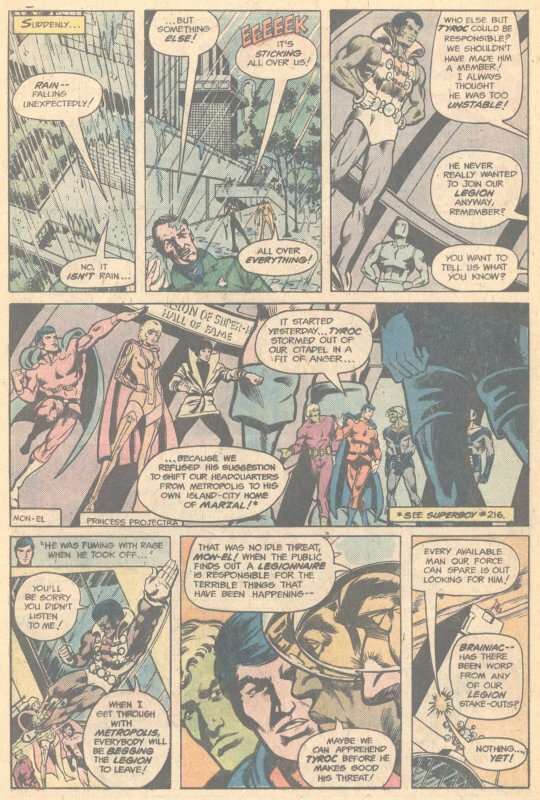 The first story starts with a string of disasters in 30th Century Metropolis, each one accompanied by a strange yell. The Science Police are certain they know who the culprit is, and they petition the Legion for action–as clearly, it is their rogue member Tyroc who is causing this destruction with his super-powered voice. To make matters worse, Tyroc had recently stormed off after the Legion refused to relocate their headquarters to his island of Marzal, threatening to coerce Metropolis to evict the Legion. The Legion has no choice but to take action. And so, the next day, Superboy, Ultra Boy, Shadow Lass and Princess Projectra are incognito in the crowd when another strange yell causes the vegetation to grow wildly. Taking care of the immediate threat, they find Tyroc lurking in the shadows and attack him. After a short chase, the renegade Legionnaire is apprehended and turned over to the Science Police to await trial. 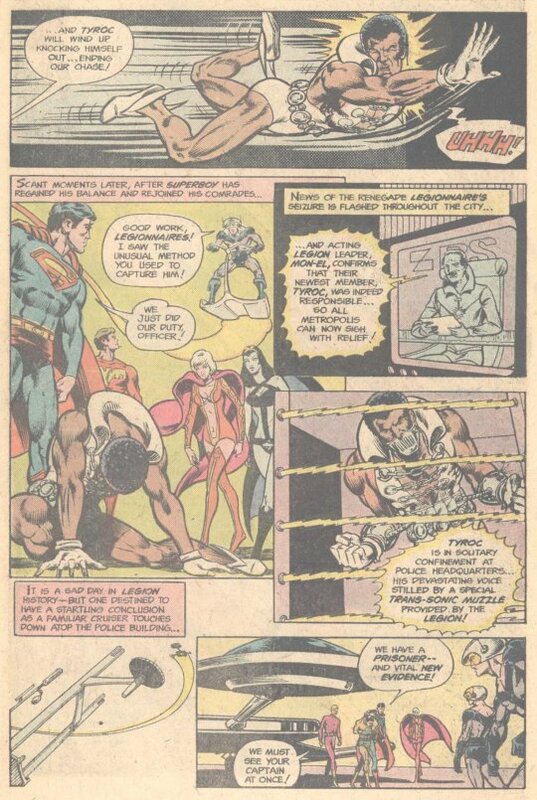 But before any trial can take place, the Legion appears having captured the true perpetrator, who had used an ultrasonic tape recorder to duplicate Tyroc’s powers. With this, Tyroc is freed–but minutes later, the real villain disappears, with only a tiny insect left escaping from his cell. That’s because he was actually Chameleon Boy and this was all a ruse to get Tyroc out of stir on the part of the Legion. So what’s really going on here? Why, it’s Weisinger standard plot #5: Tyroc’s rampage is merely a cover while his sonic scream searches out a bomb designed to obliterate Metropolis. And, of course, he had to pretend to be rogue so that the bomber wouldn’t catch on and detonate his device early. It all makes perfect nonsense. Shooter’s back-up is about the greatest hero of the 30th Century, Questar, whose exploits are thrilled to across the galaxy on Tri-Vid. Actually, they don’t look much different from the exploits of the Legion themselves, especially given Questar’s Superman-derived color scheme. Either way, a Legion delegation to Zentor is about to meet him in the flesh at a ceremony in his honor. Turns out the ceremony is a ruse–the people of Zentor are being plagued by a monster and Questar hasn’t come to aid them before this. And this is because Questar is a fraud–his powers are really, but he’s a writer and an actor rather than a true hero, making up his exploits. 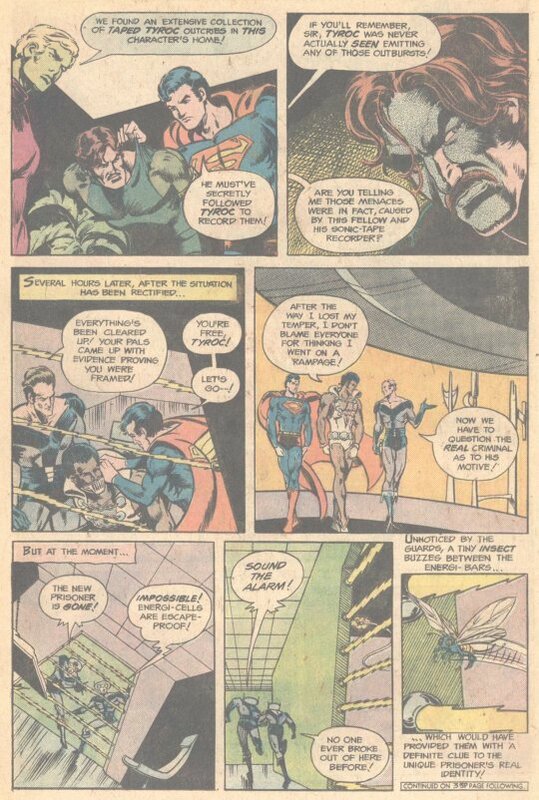 Superboy ultimately takes care of the monster using a tactic he saw in one of Questar’s action vids, and then very heavy-handedly lays out the moral of the story: Yes, Questar is a fraud but the Zentorians were similarly deceptive in bringing him here. And Questar’s legend is more important than the man, for all of the good it inspires. The logic here is dodgy, but everybody goes along with it, and Questar is crowned King of Heroes.